Mauna Kea is a special place on the island of Hawaii - its sheer size, natural beauty, big science that take place around the summit and role it plays in native Hawaiians culture make it a must-do destination for anyone visiting Big Island. Mauna Kea is one of the 5 volcanoes that make up Hawai’i Island and the highest peak in the chain. It raises 13,803 ft (4,207 m) above sea level in island’s North Koala Region, but when measured from its base deep down in the Pacific Ocean (which is actually the correct way of determining highest peaks when observed in intergalactic perspective) it is 33,100 ft (10,100 m) high, making it the highest mountain on Earth (take that, Mount Everest!). If that wasn't impressive enough, together with its “sibling” volcano Mauna Loa, they are the heaviest mountains on the planet. In fact, their combined weight is so massive that they bend Earth’s crust towards the upper mantle. Considering Mauna Kea’s size and weight, it’s amazing that the volcano is relatively young at around 1 million years of age. It is also the second oldest volcano on Big Island (younger only than Kohala volcano) and considered dormant, meaning it isn't active, but mostly likely will erupt again in a distant future. The last eruption occurred 4,600 years ago. Another interesting fact - scientists found evidence of glaciation at higher elevations of Mauna Kea, proving that during ice age periods there was a permanent ice cap around the summit all-year long. Mauna Kea has many faces and its majesty has been inspiring people since first Polynesians landed their canoes on Hawai’i. The mountain plays a significant role in native Hawaiian mythology and it is considered the most sacred peak in the entire island chain. It was “kapu” (forbidden) to all but highest chiefs to lay foot at and around the summit. According to a legend, Poliahu, the goddess of snow, reside on the slopes of Mauna Kea, while her sister, goddess of volcanoes claims Mauna Loa as her home. The two sisters are in constant battle and once Pele sent a river of lava to Mauna Kea in order to melt Poliahu snow shield and defeat her. Poliahu counter-attacked with a fierce blizzard that covered Mauna Kea in deep snow. The battle is far from over and it is said that whenever an earthquake occurs, it is actually Pele and Poliahu fighting for dominance over the twin volcanoes. Please be considerate and pay respect to this sacred site. 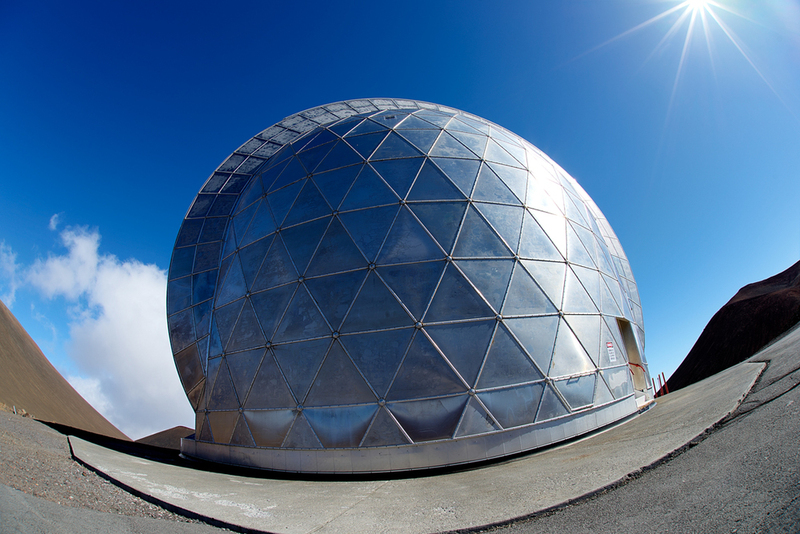 Another face of Mauna Kea lays at its very top, where 13 of the world’s most advanced telescopes scan the endless skies in search of distant galaxies, Earth-like planets and other celestial objects in the Universe. Discoveries made by them are break-through in our understanding of the reality we’re part of. Why astronomers have chosen Mauna Kea summit as location for these complicated and precise instruments? Several factors such as high altitude, extremely dry climate and predictable air flow make this island volcano one of the best sites on the planet for astronomical observations. 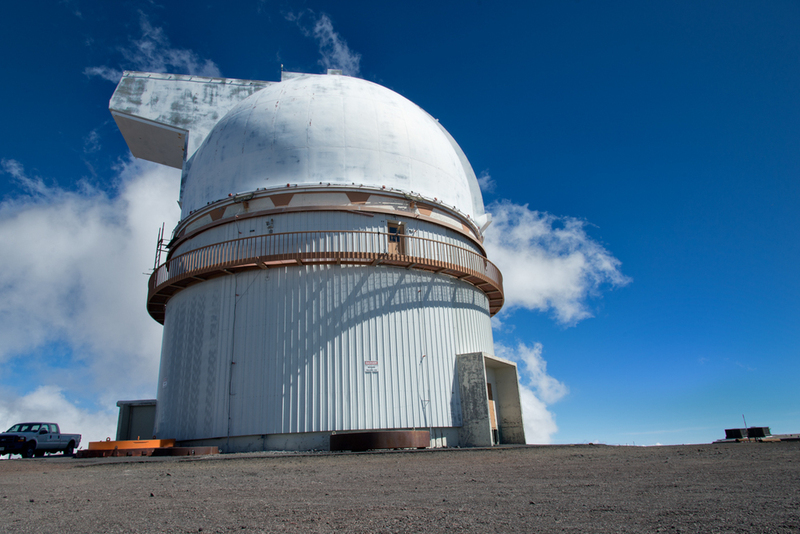 Home to the most famous Keck twin telescopes (you can even sneak-peak inside one of the two, but more on that later), big science is not always welcomed atop Mauna Kea. As I mentioned, the whole mountain and especially area around its summit are sacred to Hawaiians. Fortunately, scientists and local activists are working closely together to assure Mauna Kea receives the respect it deserves. That being said, the planned TMT (Thirty Meters Telescope) project, which is going to be the most advanced telescope with the largest mirror in the world when completed, is object of great controversy even today. Mauna Kea means “White Mountain” in Hawaiian language and that name sure fits it - snow cap often covers the area around summit in winter months, which in turn makes this volcano even more magnificent when seen from distance. Local people rush to the summit as soon as snowfall occurs to enjoy this rare winter scenery (there is even one company that rents skis and snowboarding equipment for the sole purpose of riding Mauna Kea slopes). 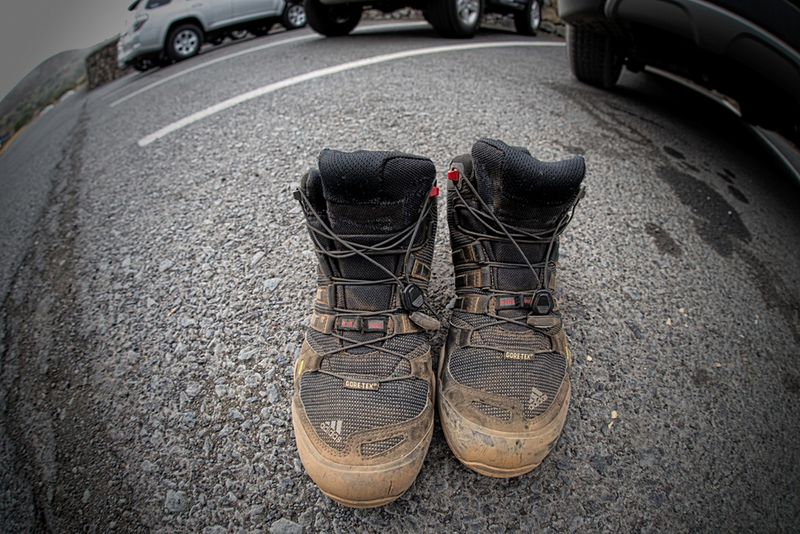 My boots after hiking Lake Waiau trail. Mauna Kea is a very high mountain, therefore alpine conditions apply here. Remember when we mentioned winter clothes in “What to take” section - Mauna Kea is the reason. The temperature at the visitor center can be up to 40°F lower than at sea level, while the area around observatories is even colder. When we visited at the beginning of June, the temperature at Keck Observatory was 41°F (5°C), so we’re talking winter jacket, hat and gloves. Bring sturdy, over-the ankle hiking boots if you plan to hike any of Mauna Kea trails. Wear sunscreen and UV proof sunglasses - high elevation combined with extremely dry climate result in exposure to dangerous levels of UV radiation. Take it seriously, you will get a sunburn quickly here if not protected from the sun. Make a 45 minutes stop at the visitor center before driving to the summit area. Altitude sickness can ruin your day if you do not wait and adapt to high elevation. Symptoms range from mild headache to serious nausea. If these conditions won’t go away after your 45 minutes safety stop, we strongly advice against going any further. Road to the summit - many words were written about if you should take a rental car to the observatories. Generally speaking, no major car rental company allows their vehicles beyond the Ellison Onizuka Visitor Center. There is a point in a contract stating that going to the summit voids it and if anything happens to you or the car, it’s on you. The first 4 miles past visitor center are on an unpaved winding gravel road with steep ascend and blind corners. After that the rest is paved but still pretty steep. You may ask why didn't they pave these 4 miles - well, astronomers and other personnel working at the summit, as well as Native Hawaiians do not want many visitors to go to the top, which is understandable considering the nature of work and holiness of the place. In fact, park rangers closely monitor how many people visit the summit per day. The road section from summit to the fourth mile past Onizuka Center is paved only because snowplowing equipment needs it (yes, there are periods where the summit area receives significant amount of snow, just Google it and see pictures). So should you take the challenge? Before we present our opinion, let’s be clear that we do not under any circumstances encourage you to void your rental contract. There is one company that rents four wheel drive trucks and allows their vehicles at the summit (here’s more info), so if you want to play it safe, choose that route. Another way is to book a trip with one of the few companies that organize sunset-watching trips. They take you to the top in 4x4 vans just before sunset and offer pre-made dinner and winter clothes to keep you warm. Although going on an organized tour would be your best bet (as they take care of everything and educate about the area too) we found them way overpriced to what they offer. But again, we’re budget travelers so if costs aren't problem for you, go ahead and take a tour. As you may guessed already, we decided to climb to the top in our Hyundai AWD (that was after we saw a couple of tourists descending the gravel road in a ford focus, by the way). The drive in thick fog as we descent Mauna Kea. Be careful out there! 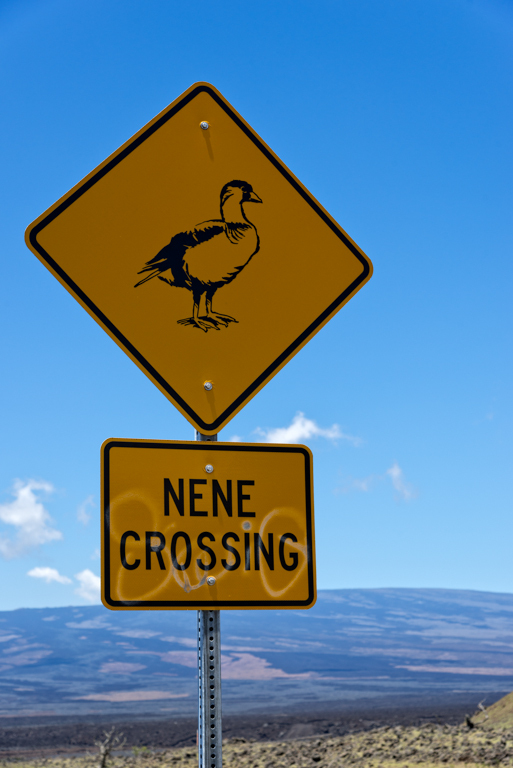 Mauna Kea is an all-day destination so we left early from our Kona cottage. Driving from the west side of Hawai’i, we passed an amazing scenery, from lava fields near Kona airport, arid desert of South Kohala through green hills up to Saddle Road. From there we turned to Mauna Kea Access Road that took us to the Ellison Onizuka Visitor Center at 9200’ (2800 m) of elevation. Remember to do a safety stop here. The visitor center offers few interesting displays and educational video about the observatories at the summit (contrary to reviews we read, stating that visitor center is rather drab and uninteresting, we found it really entertaining and the 45 minutes passed quickly). Most people start experiencing mild altitude sickness symptoms here, while few had a bad case of it when we made our stop (yes, there was vomit in the bathroom). To kill time, we strongly suggest visiting the Silversword garden next to the main building. 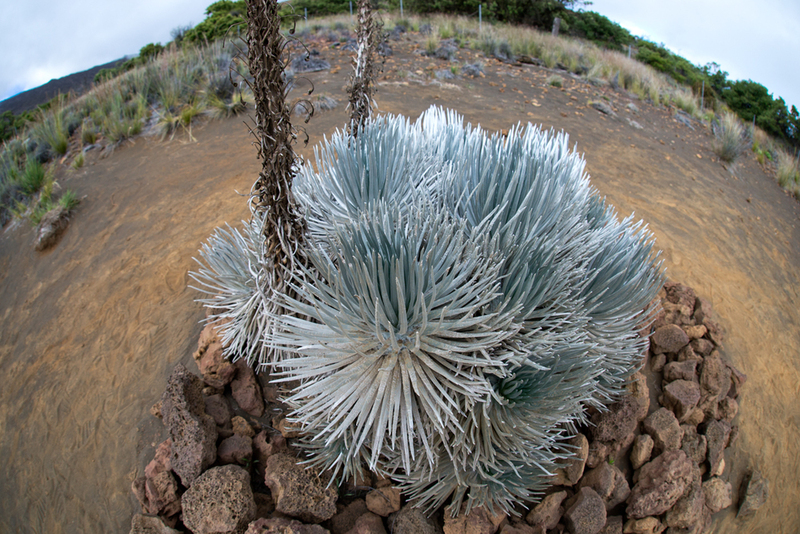 It is home to a critically endangered plant - the Mauna Kea Silversword (Argyroxiphium Sandwicense). This fascinating woody herb adapted over eons of existence to the harsh environment of volcano slopes and is endemic to Big Island. Only few plants are left in the wild and biologists trying their hardest to re-introduce Silverswords to Mauna Kea. What’s amazing about this plant is it evolved without any competition, hence its incredible lifespan. It can live up to 40 years, but it flowers once in a lifetime, producing a flower stalk that can be 6 foot (2m) tall and then dies, leaving a pod of seeds for the new generation to grow. Ellison Onizuka Visitor Center is a base of a Humu’ula Trail, one of the hardest treks on Big Island. This 12 miles out and back trail takes you to the actual summit of Mauna Kea, a cinder cone sitting right next to the observatories. It’s a serious workout through old lava desert with 4500’ of elevation gain. It is definitely on our bucket list when we return to Big Island, however we aren’t up for the challenge yet. If you plan to take this trail, be sure you can make it (previous hiking experience in alpine conditions really helps), arrive at dawn and take plenty of water - there is no shade anywhere along the trail. There is a shorter trail starting at visitor center called Pu’u Kole trail. It leads to a Red Cinder Cone on a 6.3 miles (10.1 km) out-and-back hike. Again, the entire hike is in open area so bring sun protection and plenty of water. From what I've seen in pictures, the view from atop the cinder cone must be breathtaking. To continue - we were back on the road after an hour stop at the visitor center. The unpaved section of the road starts right around the corner from Onizuka Center and continues to Mile marker 4. In retrospective, I can say I've driven on worst roads when we were on a road trip in the mainland’s Southwest, however it’s definitely not an easy ride and you can seriously beat up your rental if you’re not careful. 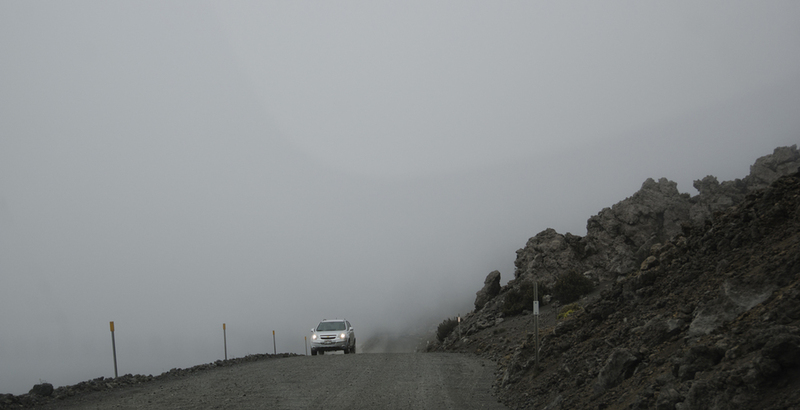 Just go slowly and watch the road, especially in fog that forms when clouds pass by Mauna Kea. After 4 miles of bumpy ride, paved section kicks in and from there it’s a much more comfortable experience. Right after passing MM 6 there is a small parking lot on the right-hand side and across the road starts Lake Waiau trail. If you have time and energy for a hike, I suggest taking it. It’s only 2.4 miles (3.9 km) round trip (you can also take the summit trail here as the two meet at the lake - the distance is 5 miles (8 km) from the parking lot to Mauna Kea summit. Lake Waiau sits at 13,020 Ft (3970 m) of elevation and it’s the only alpine lake in the state of Hawaii, as well as 7th highest lake in United States. Lake’s origin is still a topic of debate, but water comes most likely from melting permafrost (frozen ground), a leftover from last ice age. In 2010, Lake Waiau started shrinking rapidly for reasons unknown, but it regained its body of water to 75% of the original volume after a wet winter of 2013/14. Besides being an interesting distraction from otherwise arid landscape, Lake Waiau plays a very important role in native Hawaiian belief system. According to a legend, the lake is a portal for spirits to travel between this world and higher realm. It’s a sacred place and no one is allowed to approach or enter its waters. Please respect that rule. While hiking to the lake, we observed what Mauna Kea summit area is all about - its Moon-like scenery is just amazing to see and experience, there is nothing similar anywhere else on the island. Compared to a lush jungle we came from several hours earlier, it could be like we were teleported to another planet. The hike itself is a good primer to what is like walking in high elevation, where air is thin and pressure low. Many times we were gasping for air trying to comment on the beauty that surrounded us. Bring sturdy hiking boots for this one, your feet will thank you later. After completing Lake Waiau hike, it was time for a climb (in a SUV) to the summit. The view at the end of the road is just breathtaking and it doesn't take long to realize why Hawaiians treat Mauna Kea with highest respect. The surrounding landscape, painted in a palette of red, yellow and brown, with numerous cinder cones (cone shaped vents from which lava used to flow) and clouds blanketing the island below was like nothing we've seen before. It’s hard to imagine that down the slopes, where ocean meets the volcano, tropical fish and corals abound! Scenery is not the only reason worth driving to the summit area - 13 of the world's most powerful astronomical telescopes lay just left of the actual summit (that’s where the Humu’ula Trail ends). Generally speaking, observatories are closed to public, however you can park right next to most of them and see these technological marvels from up close. Moreover, there are organized tours to Subaru Observatory, you can check more information about it here . 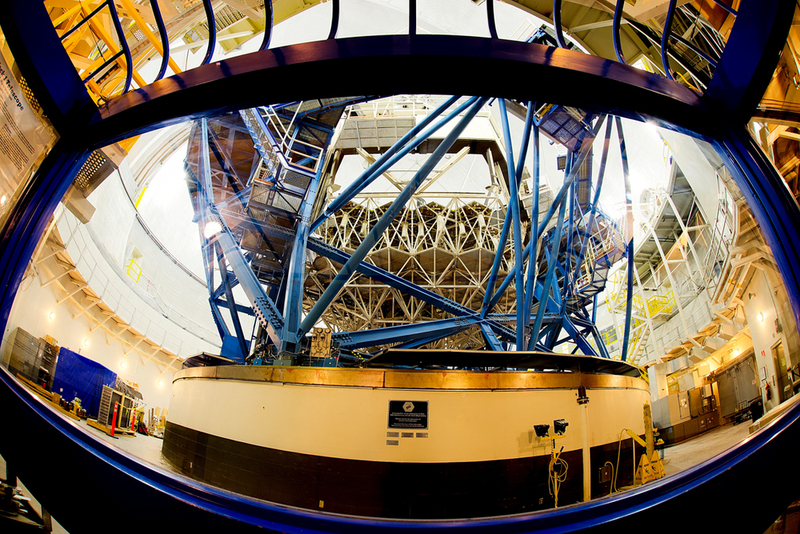 Another way to sneak peek inside these gentle giants is to stop at the world largest telescope (and by largest meaning it has the largest mirror collecting light particles coming to our planet from outer space) - the Keck Observatory. There is a gallery displaying the history of Keck twin telescopes and discoveries they made throughout the years. There is also a small room with glass wall, through which you can see the actual telescope (stay there a while and see how the huge mechanism moves several hundred tons with grace). We tried to stop and see every telescope, as they are all different and interesting in their own regard. 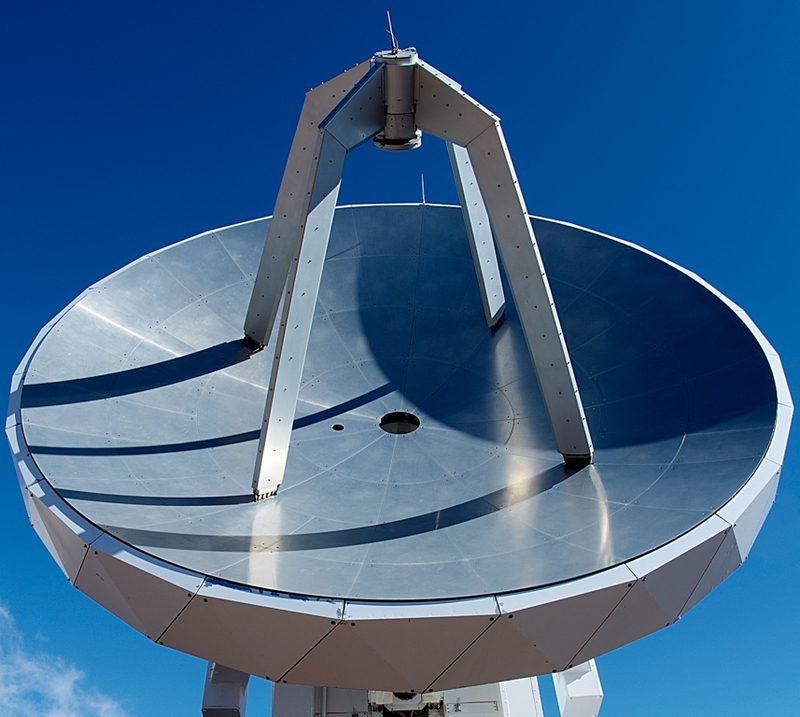 While not being expert astronomy enthusiasts, having a chance to admire these great inventions of humanity with our own eyes left a feeling of appreciation to the people who built them and who work there. Sunset time was approaching and we decided to drive back to the Onizuka Visitor Center for their free daily stargazing program. While you can stay at the summit to watch the sunset (and it sure is an amazing spectacle to see) we were a little worried of driving back at night in the fog cover. True is, you can only stay at the summit up to 30 minutes after sunset, as light from car’s headlights interfere with the precise equipment astronomers use. The way down from the observatories is more challenging due to steep grade of the road. Try to brake with your engine rather than brake pads and if you opted for 4x4 vehicle, switch to low gear and you’ll be fine. The stargazing program at visitor center was a blast! The crew consisting of park rangers and volunteers set up several telescopes and point them at various heavenly objects, like our natural satellite Mars, Saturn and other planets in the Solar System. Seeing Saturn rings and Moon craters was an extraordinary experience. The sky at the visitor center is free of clouds most of the year, so don’t worry if it’s cloudy during the day (as it was when we were there) - when temperature drops the clouds go away, revealing pitch black sky with thousands of stars to watch. In summary, Mauna Kea should be on everyone visiting Big Island list. It’s a special place and a great excursion from the tropical settings just few miles below. We highly recommend visiting this dormant volcano - you won’t regret it.